Clement XI was a patron of the arts and of science. He was also a great benefactor of the Vatican Library, his interest in archaeology is credited with saving much of Rome’s antiquity. He authorized expeditions which succeeded in rediscovering various ancient Christian writings and authorized excavations of the Roman catacombs. Giovanni Francesco Albani was born in 1649 in Urbino to a distinguished family of Italian and Albanian origin. His mother Elena Mosca (1630-1698) was a high-standing Italian of bergamasque origin, descended from the noble Mosca family of Pesaro. His father Carlo Albani (1623-1684) was a patrician descended in part from the Staccoli family, who were patricians of Urbino, in part from the Giordani, who were nobles of Pesaro, and in part from the noble Albani family which had established itself in Urbino from northern Albania in the 15th century. Unusually, from the viewpoint of current practice, his election came within three months after his ordination as a priest and within two months after he celebrated his first Mass, though he had been a cardinal for ten years previously. Having accepted election after some hesitation, he was ordained a bishop on 30 November 1700 and assumed the pontifical name of "Clement XI". Cardinal protodeacon Benedetto Pamphili crowned him on 8 December 1700 and he took possession of the Basilica of Saint John Lateran on 10 April 1701. 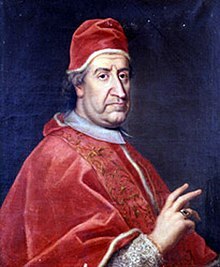 In 1703 Pope Clement XI ordered a synod of Catholic bishops in northern Albania that discussed promotion of the Council of Trent decrees within Albanian dioceses, stemming conversions among locals to Islam and securing agreement to deny communion to crypto-Catholics who outwardly professed the Muslim faith. In 1713 Clement XI issued the bull Unigenitus in response to the spread of the Jansenist heresy. There followed great upheaval in France, where apart from theological issues, a strong Gallican tendency persisted. The bull, which was produced with the contribution of Gregorio Selleri, a lector at the College of Saint Thomas, the future Pontifical University of Saint Thomas Aquinas, Angelicum, condemned Jansenism by extracting and anathematizing as heretical 101 propositions from the works of Quesnel declaring them to be identical in substance with propositions already condemned in the writings of Jansenius. During his reign as a pope the famous Illyricum Sacrum was commissioned, and today it is one of the main sources of the field of Albanology, with over 5,000 pages divided in several volumes written by the Jesuit Daniele Farlati and Dom Jacopo Coleti. Clement XI extended the feast of Our Lady of the Rosary to the Universal Church of the Roman Rite in 1716. Clement XI created a total of 70 cardinals in 15 consistories. Notably, one cardinal of his own creation was Michelangelo dei Conti who became his immediate successor, Pope Innocent XIII. Clement XI died in Rome on 19 March 1721 at 12:45pm and was buried in the pavement of St. Peter's Basilica rather than in an ornate tomb like those of his predecessors. ^ a b Frazee, Charles (2006). Catholics and Sultans: The Church and the Ottoman Empire 1453–1923. Cambridge University Press. pp. 167–168. ISBN 9780521027007. "...since the pope was of Albanian ancestry (demonstrated by his name of Albani)." ^ a b Martucci, Donato (2010). I Kanun delle montagne albanesi: Fonti, fondamenti e mutazioni del diritto tradizionale albanese. Edizioni di Pagina. p. 154. ISBN 9788874701223. "Nel 1703, per iniziativa di Papa Clemente XI (che era di origini albanesi) si tenne il primo Concilio Nazionale Albanese, in cui si cercò di promuovere l'applicazione dei decreti del Concilio di Trento nelle diocesi albanesi, di arginare la marea di conversioni all'islam"
^ http://en.radiovaticana.va/news/2014/09/21/fr_lombardi_papal_journey_a_blessing_for_all_albanians/1107019, ..."a silver portrait of Pope Clement XI – who belonged to the Albani family, so was traditionally of Albanian origin." ^ a b c "Family Tree of Giovanni Francesco Albani". geneanet.org. Retrieved 26 November 2018. ^ Williams, George L. (2004). Papal Genealogy: The Families and Descendants of the Popes. McFarland. p. 116. ISBN 9780786420711. ^ Skendi, Stavro (1967). "Crypto-Christianity in the Balkan Area under the Ottomans". Slavic Review. 26 (2): 235–242. doi:10.2307/2492452. JSTOR 2492452. ^ "Accessed 2-5-2012". .fiu.edu. Retrieved 2013-06-23. ^ Heal, Kristian S. (2005). "Vatican Syriac Manuscripts: Volume 1". Hugoye: Journal of Syriac Studies. 8 (1). Archived from the original on 25 May 2011. Retrieved 17 April 2011. Herbermann, Charles, ed. (1913). "Pope Clement XI" . Catholic Encyclopedia. New York: Robert Appleton Company. This page was last edited on 31 March 2019, at 18:45 (UTC).